Fight Entropy's a bit quiet right now given our general end-of-the-year schedules, so today we're calling attention to a few of our most popular posts from the past. We hope you enjoy them, and look forward to writing more in 2012. The Annual Reviews have come out with a new journal (a few issues old) that will be extremely useful resource for many FE readers: Annual Review of Resource Economics. ABOUT THIS JOURNAL: The Annual Review of Resource Economics, provides authoritative critical reviews evaluating the most significant research developments in resource economics, focusing on agricultural economics, environmental economics, renewable resources, and exhaustible resources. To get a sense of the journal, I just cut and pasted the most recent table of contents below (authors aren't listed, but many of them are quite distinguished). 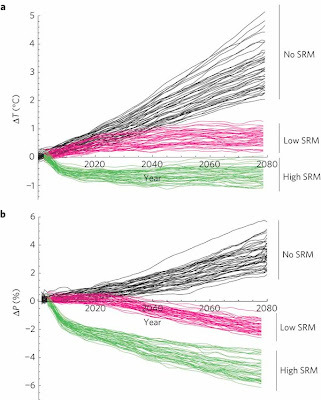 My colleagues and I have been pushing the idea that ENSO forecasts should be broadly integrated into economic, security and social policies in the tropics and subtropics. 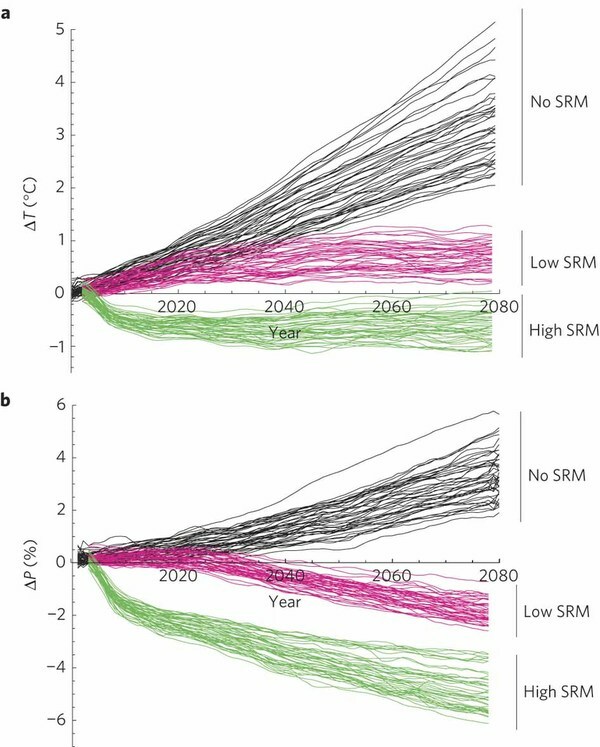 In a talk to policy folks yesterday, I tried to point them towards an excellent resource provided by the International Research Institute for Climate and Society (at Columbia) that aggregates ENSO forecasts across many modeling groups (here). Their current forecast for 2012 (Sep-Nov) is a 27% chance of El Nino, a 52% chance of neutral conditions and a 21% chance of La Nina. 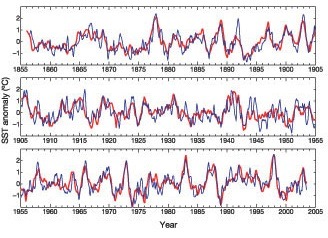 Time series of SST anomalies averaged in the NINO3.4 region (5° S–5° N, 120–170° W). 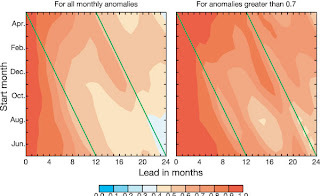 The red curve is monthly analysis of [reconstructed observations] and the blue curve is the LDEO5 prediction at 6-month lead. Source: Nature. These are shown as a function of start month and lead. The straight green lines denote the verification month of May. The left panel is based on all monthly anomalies, while the right panel is for anomalies with amplitudes greater than 0.7 °C. The colour bar shows the range of correlation coefficients. Source: Nature. 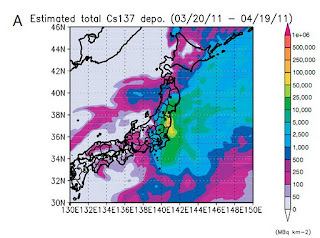 As a general characteristic, most of the eastern parts of Japan were effected by a total 137 Cs deposition of more than 1,000 MBq km−2 . Our estimates show that the area around NPP in Fukushima, secondarily effected areas (Miyagi and Ibaraki prefectures), and other effected areas (Iwate, Yamagata, Tochigi, and Chiba prefectures) had 137 Cs depositions of more than 100,000, 25,000, and 10,000 MBq km−2 , respectively. 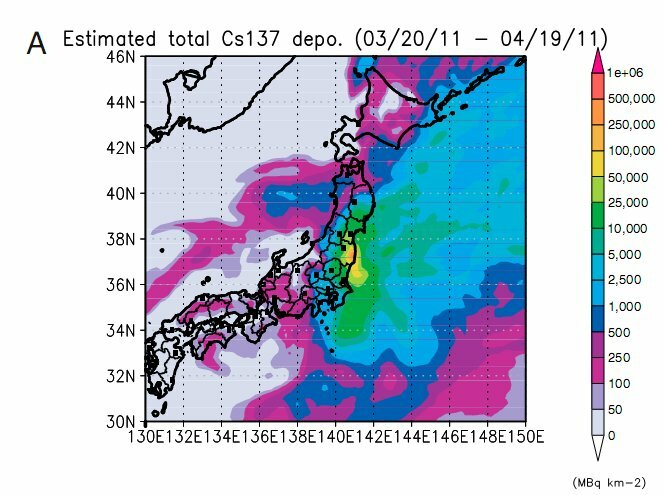 Airborne and ground-based survey measurements jointly carried out by MEXT and the US Department of Energy (DOE) (21) show high 137 Cs deposition amounts were observed northwestward and up to a distance of 80 km from Fukushima NPP. It was estimated from the first measurement that by April 29, more than 600,000 MBq km−2 had been deposited in the area, which is greater than our estimate of less than 500,000 MBq km−2 (Fig. 2A), yet well within the range of uncertainty of our method (Fig. S4). We use prenatal exposure to Chernobyl fallout in Sweden as a natural experiment inducing variation in cognitive ability. Students born in regions of Sweden with higher fallout performed worse in secondary school, in mathematics in particular. Damage is accentuated within families (i.e., siblings comparison) and among children born to parents with low education. In contrast, we detect no corresponding damage to health outcomes. To the extent that parents responded to the cognitive endowment, we infer that parental investments reinforced the initial Chernobyl damage. From a public health perspective, our ﬁndings suggest that cognitive ability is compromised at radiation doses currently considered harmless. The heaviest fallout in Sweden (also due to Cesium 137 contamination) was around 65 kBq m-2 (see figure 2 of the paper). Moreover Japan's population density is roughly an order of magnitude larger than Sweden's. Given this, it looks like the long term human costs of this disaster may be absolutely staggering. A new paper finds evidence to support the "rapacity" or "prize" mechanism as an important factor driving civil conflict. The Office of the Under Secretary of Defense released a report on Trends and Implications of Climate Change for National and International Security, including recommendations for next steps. Here's a fun 2006 QJE paper that recently ran into. I especially like that they authors made a free down-loadable poster to go along with the paper! Abstract: We study the extent to which U. S. urban development is sprawling and what determines differences in sprawl across space. Using remote-sensing data to track the evolution of land use on a grid of 8.7 billion 30 30 meter cells, we measure sprawl as the amount of undeveloped land surrounding an average urban dwelling. 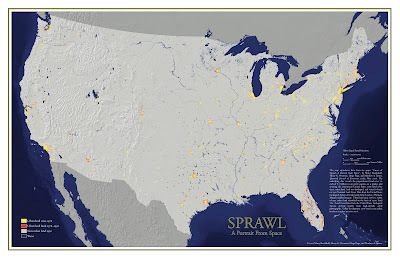 The extent of sprawl remained roughly unchanged between 1976 and 1992, although it varied dramatically across metropolitan areas. Ground water availability, temperate climate, rugged terrain, decentralized employment, early public transport infrastructure, uncertainty about metropolitan growth, and unincorporated land in the urban fringe all increase sprawl.